Gujarat Chief Minister Vijay Rupani hands an MOU prepared by Project ‘Life’ to Dr. Sudhir Parikh, publisher of News India Times and recipient of India’s Padma Shri award, at their Aug. 10 meeting in Gandhinagar. 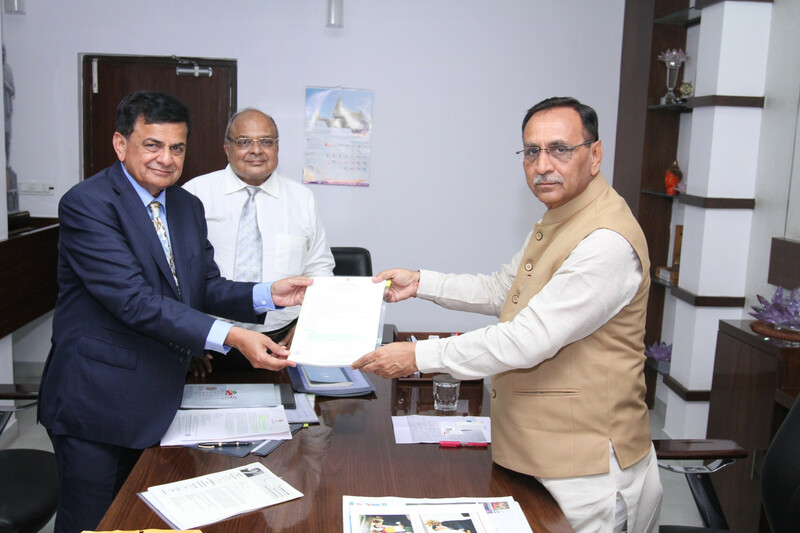 Dr. Sudhir Parikh, publisher of News India Times and recipient of India’s Padma Shri award, met Chief Minister of Gujarat Vijay Rupani Aug. 10, in Gandhinagar, to discuss measures that may help make Gujarat a Thalassemia-free state. Dr. Parikh is the joint secretary USA, of the Global Association of Physicians of Indian Origin (GAPIO) which has members from 34 countries, and aims to represent 1.2 million physicians of Indian origin around the world. He is also a long-standing member of the American Association of Physicians of Indian Origin (AAPI). He has been striving to enlist members of GAPIO to provide voluntary medical services to underserved areas in India. Dr. Sudhir Parikh, second from left, speaking during a meeting with Gujarat Chief Minister Vijay Rupani, right, Aug. 10, on measures that can be taken to prevent the spread of Thalassemia disease. During his visit to India, Parikh also met Prime Minister Narendra Modi in New Delhi Aug. 8, to discuss starting a think tank in the U.S., for advocacy on India’s development including healthcare. Recently, Dr. Parikh was chosen by Life Global, an Indian non-profit, as Senior Advisor to the organization. 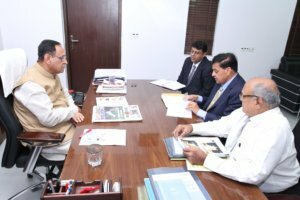 He, along with Chandrakant Koticha, executive trustee of Project Life informed Chief Minister Rupani about the activities of the Life Blood Centre in Rajkot, Gujarat. Also present at the meeting was Ashwin Kumar, secretary to the Chief Minister. 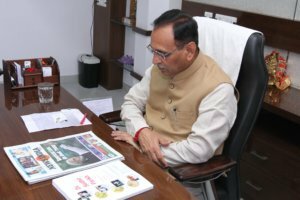 The meeting with Chief Minister Rupani focused on prevention and control of Thalassemia disease, a genetic defect caused by a blood disorder. 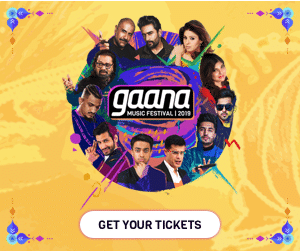 According to a press release from Project ‘Life’, Chief Minister Rupani agreed in principle, to the measures suggested during the meeting, saying his government had taken note about making Thalassemia test mandatory for all, especially for woman at the prenatal stage; incorporating the blood group on AADHAR cards, drivers licenses, passports and other identity documents issued by the Government, among other measures. This would make it possible also to help speed up and optimize medical care given to victims of accidents. All possible efforts should be taken to prevent children from having Thalassemia, by conducting tests on couples before engagement and marriage between couples, as well as developing an exclusive directory indicating blood group of government and semi-government employees, employees of corporate houses, factory workers etc., to help with emergency blood donations to save lives. During the meeting, Chief Minister Rupani agreed to table a bill in the state assembly on the mandatory testing for Thalassemia and for documenting the blood group on various government ID cards. The establishment of an Academy of Blood Transfusion in collaboration with Project ‘Life’ was also discussed during the meeting. Dr. Parikh emphasized the judicious use of the blood. Though India had 2,760 blood banks, Parikh said, the Life Blood Centre of Rajkot is one-of-a-kind, well equipped with modern machines like X-Ray Irradiator & ID Nat-Test, supplying safe and quality blood and blood components. Life Blood Centre is the first one in Gujarat to acquire the X-Ray Blood Irradiator – that irradiates blood to reduce risk of TA-GvHD (Transfusion Associated Graft versus Host Disease). The possibility of an MOU between Project ‘Life’ AAPI & GAPIO will also be explored. 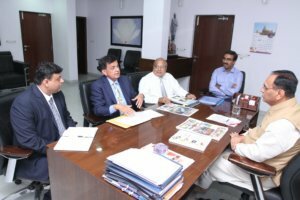 Dr. Parikh also suggested that as a part of Health Wellness, a postal stamp may be released on the occasion of World Thalassemia Day on May 8 next year, the World Blood Donor Day on June 14, and International Yoga Day on June 21.